Post 9/11 the need for an expansion of surveillance and greater expenditure on surveillance capabilities has been argued for by government and industry to help combat terrorism. This has been coupled with increasing incorporation of surveillance technologies into the routine practice of criminal justice. 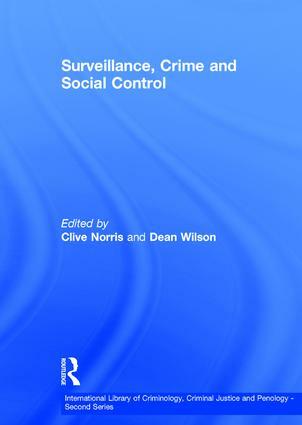 This important collection draws together key contemporary writings to explore how the surveillance gaze has been directed in the name of crime control. Key issues include theories on surveillance, CCTV, undercover police surveillance, bodies databases and technologies, and surveillance futures. It will be an essential collection for law librarians and criminologists. Clive Norris is Professor of Sociology at the University of Sheffield and Deputy Director of the Sheffield Centre for Criminological Research. He is one of the founding editors of the free on-line journal 'Surveillance and Society' and is currently researching the impact of new surveillance technologies on criminal justice. Dr Dean Wilson is a Lecturer in Criminology in the School of Political and Social Inquiry, Monash University, Melbourne, Australia. Dean's research interests include Closed Circuit Television in urban Australia, the social impact of biometric technologies, histories of policing and media representations of crime.